Medical Problems of the Eyes, Ears, Nose and Throat: Glaucoma symptoms, sinus infection, ringing in the ears, vertigo treatment, and more. Learn the smart steps for sinus infection treatment, recognizing glaucoma symptoms, curing ringing in the ears and more. This new FREE Guide will show you how. The eyes, ears, nose, and throat work together and independently to help us perceive our world through sight, sound, scent, and taste. Losing any of these senses will rob you of many of life’s pleasures. Loss of taste or smell can take the joy out of even simple meals. Loss of hearing can expose you to danger and leave you isolated. Loss of sight can literally leave you in the dark and threaten your independence. The fact is, you can safeguard your senses. You can maintain your senses of taste and smell. You can enjoy years of better vision and sharper hearing. That’s why University Health News is offering you this new guide absolutely free. It is that important. This valuable guide will give you an essential understanding of the most frequent diseases of the eyes, ears, nose, and throat. You’ll know if you are at risk and how to lessen that risk. You’ll know the warning signs, the defining tests, and the best courses of action to halt and even reverse a disease’s effects. Can you cut your risk of a sinus infection or sinus headache? What are glaucoma symptoms? What about cataract symptoms? What causes ringing in ears and how do you quiet it? What’s the best way to delay age-related hearing loss? How safe is LASIK eye surgery? This free guide will answer all those questions and dozens more. It’s yours to download right now! Why the “air puff” test is not a good way to test for glaucoma symptoms, and what is better. The single best thing to do to protect your hearing. How to alleviate sinus infection pain and pressure–without medicines or decongestants. Which effective AMD drug can save you $1,900 a dose compared to its often-prescribed competitor. How what you eat could trigger acute laryngitis. Be good to your eyes. Learn the best strategies for preventing and treating AMD, glaucoma symptoms, cataract symptoms, and more. If you are over 50, you are increasingly at risk for an eye disorder. For example, half of all people between 65-74 have cataracts. Glaucoma is most prevalent in people over 60. And AMD, age-related macular degeneration, is called “age-related” for a reason! As you grow older, you’ve got to be wiser too. That means knowing what to do not only when disease strikes, but what to do before and after. You should know the warning signs. You should know how a diagnosis is made. You should know your best treatment options. In this free guide you’ll discover why women are at a higher risk of cataracts than men. You’ll find out about the most common cataract symptoms…a new surgical technique that results in better visual acuity…and four preventive lifestyle changes you should make now. You’ll read why tonometry gives a more accurate measure of internal eye pressure than the eye puff test for glaucoma. You’ll be alerted to the glaucoma symptoms that indicate a medical emergency…the one medication choice with fewest side effects…and a 20 minute laser surgery for controlling intraocular pressure. In the free guide you’ll learn how Avastin, at as little as $50 a dose, may treat wet AMD as effectively as Lucentis at $2,000 a dose. You’ll read about a supplement formula that can dramatically slow the disease for ten years or more. And you’ll be briefed on three lifestyle changes that can cut a woman’s risk of AMD by two-thirds! Don’t be blindsided by AMD, by cataracts, or by glaucoma symptoms! There’s no reason an eye disease should cloud your future. For all that you are looking forward to, download your copy of this valuable guide now. It’s yours absolutely free! Do you ever have earaches? Ringing in ears? Sometimes struggle to hear what’s being said? You can end the pain and the strain! Like the eye, the ear is complex. With the complexity can come complications. 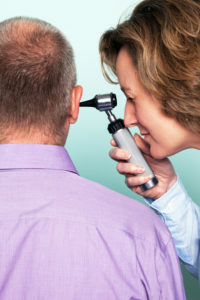 You can suffer painful ear infection symptoms, distracting tinnitus (ringing in ears), disturbing vertigo, or hearing loss. The good news is that you can reduce the likelihood of an ear infection, enjoy relief from tinnitus, successfully treat vertigo, and delay or even prevent the onset of age-related hearing loss. Ear infection symptoms, for example, are often triggered by causes unrelated to the ear (The free guide names six on Page 24). And “swimmer’s ear,” the cause of most outer ear infections, can come from bathing or showering. You’ll also learn the best ways to reduce pain without medications. In the guide you’ll find out why “ringing in ears” occurs more frequently in men…medications to avoid if you do suffer tinnitus… and four tinnitus treatment strategies that are proven effective at offering relief. In the report, the editors share the latest findings on vertigo causes and vertigo treatment. You’ll learn about breakthroughs in diagnosis … a 10-minute “maneuver” doctors are using to treat the most prevalent form of vertigo…and two ways to prevent recurrence. The guide will tell you what to do if you sense a hearing problem… the appropriate screenings…the latest advances in hearing aids and implants…and why limiting exposure to noisy environments remains the single best thing you can do to protect against hearing loss. Don’t miss a word. Download your free copy of this new guide now! You can enjoy greater protection against sinus infection, nasal allergies, laryngitis, and difficulty swallowing. When a sinus infection leaves you stuffed up or laryngitis leaves you at a loss for words, you know just how frustrating these ailments can be. Although not life-threatening, they are unpleasant, inconvenient, and, most often, avoidable. Sinusitis, or sinus infection, can be of short duration, or last for weeks at a time. Based on its source, a nasal allergy can pass quickly or remain persistent. The free guide, Medical Problems of the Eyes, Ears, Nose and Throat: Glaucoma symptoms, sinus infection, ringing in the ears, vertigo treatment, and more, examines the causes, screenings, treatments, and methods of prevention. You’ll be briefed on the merits of old-fashioned steam to relieve sinus pain…on the best tests to isolate an allergen…and ways to reduce your exposure to sinus infection triggers. You’ll get tips for saving your voice from laryngitis and coping with difficulty swallowing. You’ll read how spicy foods can contribute to laryngitis…when hoarseness may signal a serious condition …and three techniques to reduce your risk of swallowing difficulties. You can prevent sinusitis and laryngitis…you can maintain your hearing…you can reduce the risk of glaucoma symptoms and AMD. You can protect the senses you depend upon most! As we age, the assaults upon our senses become more prevalent. That means we need to be more vigilant. We must do all we can to prevent the diseases that affect our eyes, ears, nose and throat. And we need to properly and promptly treat any ailments that do occur. Reward your senses with the care they deserve. Get your copy of this new free guide today. P.S. Like every University Health News report, this guide is 100% advertising-free. We are committed to bringing you health information that is useful, authoritative, and impartial. The guide is yours to download now—absolutely free! I am interested in your free article. I would like to know more on tinnitus, what foods to avoid and what can bring relief. I was told that there is no cure for this. Does thick yellow mucus with some blood intertwined indicate an infection? I also have no voice, hard to swallow, and plugged up ears.